TULSA, Okla., (April 10, 2018) – Sweets & Cream, Tulsa’s newest neighborhood bakery and ice cream sandwich shop, is proud to announce its “Tips for Charity” program as a way to give back to local community. During March, tips were used to bake and donate 30 dozen cookies to the John 3:16 Mission in downtown Tulsa. 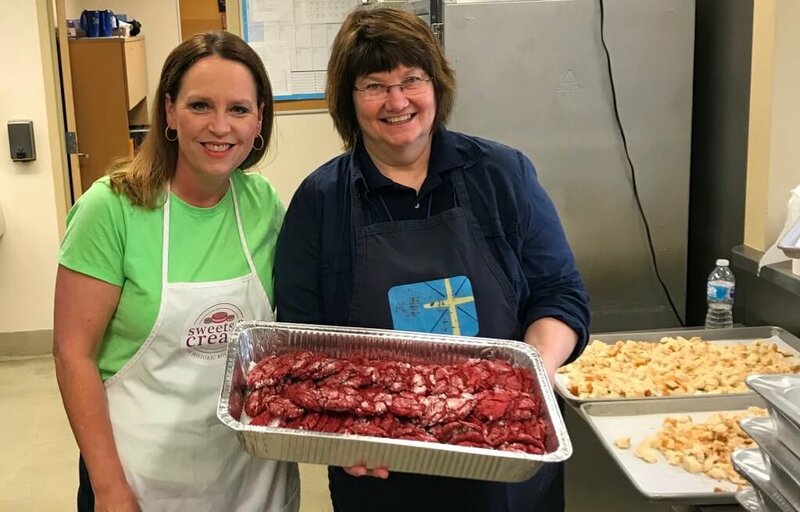 With generous customer donations, over 300 people were provided a local treat in addition to the hot meal they receive from the John 3:16 Mission. This, “Tips for Charity”, program will continue year round and will rotate charities each month. “I have always had a passion for giving back to the Tulsa community,” said Kimberly Norman, co-owner. “I also take special interest in working with newly created nonprofits, so we will also be partnering with up and coming organizations in the area who are looking to engage more with the community,” she said. Sweets & Cream, Tulsa’s newest neighborhood ice cream sandwich shop opened March 17. This is the first establishment in Tulsa to specialize in homemade build-your-own ice cream sandwiches. With 12 cookie flavors, 12 Hiland ice cream flavors, two brownies and a sugar free and gluten free option, the possibilities are endless for cookie ice cream sandwich creation. Sweets & Cream is located at 1114 South Yale Ave. Tulsa, Okla. 74112. The shop will be open Wednesday through Thursday 3 p.m. to 8 p.m. and Friday through Saturday noon to 9 p.m. Cookie ice cream sandwiches are affordably priced at $1.99 plus tax. For more information, visit www.sweetsandcream.com or follow on Facebook and Instagram (@sweetsandcream). Sweets and Cream is a local build-your-own ice cream sandwich shop on the 11th street corridor and Route 66 in Tulsa, Okla. The mission of Sweets & Cream is to be able to share homemade treats with the community at affordable prices.